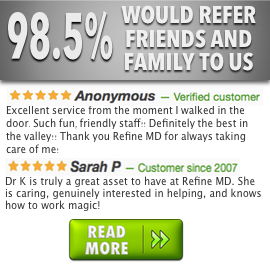 What is Refine Returns at Refine MD? Refine MD, the Fox Valley's elite medical spa, is excited to introduce Refine Returns, a membership reserve club designed to offer exclusive, year-round access to the best medispa services and benefits. To find out more about Refine Returns, check out our Specials! © 2016. Refine MD. All Rights Reserved. Site by Visual Imaging Solutions, a service of Behreandt Visuals.